미국에 있는 도널드 트럼프 대통령의 비난자들이 믿기 어려운 일이 일어났다. 트럼프 대통령이 역사적인 12일 간의 동아시아 순방을 통해 북한에 대한 압박과 제재에 대한 지지를 강화했고 문재인 대통령과 친밀한 관계를 쌓았으며 시진핑 중국 주석으로부터 북한 문제를 두고 협력하겠다는 약속을 받아내는 등 매우 훌륭하게 일을 해낸 것이다. 그는 순방을 하면서 동남아시아 지역안보라는 매우 다른 문제를 심도 있게 알게 되었고 어려운 교역 문제를 다뤄야 했다. 그는 외교에 있어서 경험이 미천하고 서투르다고 평가되어 왔다. 하지만 그는 가는 곳마다 무엇을 말해야 하는지 알고 있는 듯했다. 이 점은 어떤 것이든 트럼프 대통령을 비난하는 데 여념이 없는 일부 미국의 비판자들에게는 충격적으로 환상을 깨뜨리는 것이었다. 이들은 한국에서 트럼프를 반대하는 시위가 크게 일어났고 성조기와 태극기를 흔드는 한국인들은 거의 존재하지 않는다고 주장하려고 애썼다. 하지만 트럼프 대통령이 받은 환대를 왜곡하려는 이들의 열망은 트럼프의 대통령직 뿐 아니라 한미동맹 관계를 추락시키고 훼손하려는 것이다. 미국 역대 대통령들 중 가장 긴 해외 순방 중 하하나인 트럼프 대통령의 이번 동아시아 방문은 그가 하는 말이나 행동은 다 혹독하게 비판하는 것을 절대 멈추지 않는 적들의 공격에도 불구하고 국내에서 좋은 이미지를 쌓았다. 트럼프 대통령과 문재인 대통령은 북한의 핵과 미사일 시설에 대한 선제공격을 포함한 군사적 옵션의 필요성을 두고 동의하지 않지만 이번 방문에서 그는 문 대통령과의 관계를 강화했다는 것은 부인할 수 없는 일이었다. 문 대통령과 정상회담을 한 후 트럼프 대통령은 나도 참석했던 청와대 기자회견에서 문 대통령 옆에 서서 자극적인 용어를 사용하지 않았다. 그는 역시 내가 참석했던 국회에서 극단적으로 직설적인 연설을 하지 않았다. 하지만 트럼프는 자신이 한국에 오기 1주일 전 방한했던 짐 매티스 국방장관과 한국에 같이 온 H.R. 맥매스터 국가안보보좌관을 기쁘게 하는 방식으로 군사적 보복 가능성을 과시했다. 그는 서울에 있으면서 한반도 근처에 미국의 군함들이 있다는 것을 알라고 말했다. 그들은 공격할 준비가 다 되어 있다고 말하는 듯했다. 한미 양국 대통령이 동의한 것처럼 한국은 국방력을 강화하고 있다. 트럼프는 한국이 고급레이더, 최신 무기 등 수십억 달러의 미국 군사장비를 구입할 가능성을 고수해왔다. 청와대에서 문 대통령과 나란히 서 있던 트럼프가 의기양양하게 말했던 것처럼 한국과의 국방계약은 커져가는 한미 간 교역불균형을 바로 잡고 미국 노동자들에게 일자리를 제공하는 데 도움이 될 것이다. 하지만 이번 방문 중 교역은 후순위에 있었다. 트럼프는 방한 중 교역 이슈에 대해 언급했지만 일본과 중국에서 더 많이 강조했다. 하지만 교역에 대한 그의 말은 어떤 영향도 없었다. 문 대통령은 기자회견에서 이에 대해 언급하지 않았고 중국의 시진핑 주석은 막연한 말만 했다. 미국은 한미자유무역협정에서 사소한 것을 두고 협상하고 있고 중국과 일본은 피상적인 양보를 하고 있어 미국의 교역 적자는 계속 증가할 것으로 보인다. 하지만 트럼프는 국회 연설에서 한국의 성취에 찬사를 보냈고 장황하고 상세하게 북한을 비판하면서 한국인들의 애국심에 호소했다. 트럼프의 ‘힘을 통한 평화’와 한미동맹의 우수함에 대한 열정적인 강조는 그가 한미동맹에 대해 얼마나 진지한지 의심했던 한국인들과 미국인들 모두에게 안심이 되었다. 하지만 트럼프의 베트남 방문은 미국과 혹은 한국에서 반대의 효과를 내고 있다. 트럼프는 미국이 지원한 남베트남 군대가 패배하고 사이공 정권이 붕괴된 후 40년이 지난 지금 2000년 전의 싸움을 들먹이며 승리자들을 높이 평가하며 미국과 남베트남 군대를 궤멸시키는 데 필요했던 그들의 정신과 용기를 축하했다. 미국이 남중국해를 비롯, 이 지역에 대한 중국의 힘에 맞서기 위해 베트남과 가까운 관계를 형성하고 있지만 베트남에서 오랜 시간을 보낸 사람들에게는 베트남의 대패배와 한반도에서 남북한이 대립하고 있는 상황의 유사성은 경고가 되고 있다. 감사하게도 한국은 베트남과는 정반대다. 휴전선 남쪽에는 북한군이 없고 일부 친북 멍청이들을 제외하고는 결국 속임수가 될 평화협정에 대한 논의가 없다. 우리는 트럼프 대통령이 미국과 남베트남군이 패배했던 것이 한국에서는 절대 반복되어서는 안 될 교훈으로 기억하며 그가 한국에서 한 약속들을 지키기를 희망할 뿐이다. President Donald Trump's critics in the US find it hard to believe. 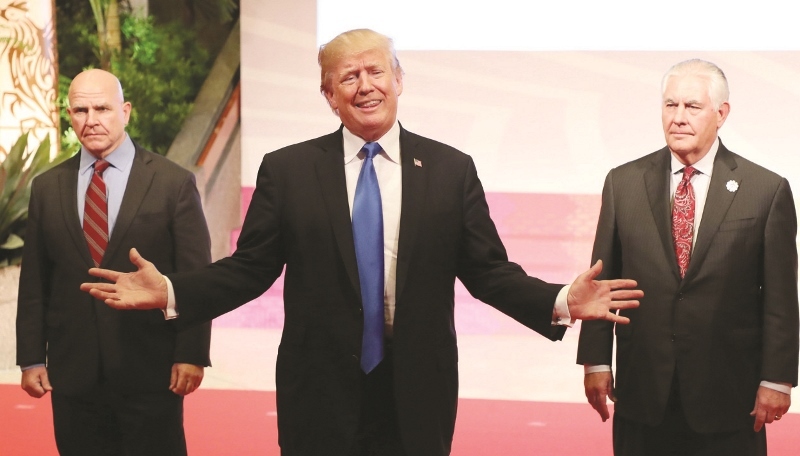 He actually made a good impression during his epic 12-day-journey through East Asia, revving up support for pressure and sanctions on North Korea, building up rapport with President Moon Jae-in and evincing pledges of cooperation on North Korea from China's President Xi Jining. Then too, while he was making the rounds, he also got into difficult trade issues while looking into very different problems of regional security in Southeast Asia. He might be regarded as inexperienced and undiplomatic in foreign affairs, but he seemed to know what to say wherever he went. That was quite disillusioning to some American pro-Northers, eager to jump on him for just about anything. Pro-Northers in the U.S. tried to claim the anti-Trump demonstrations in Seoul were huge while those waving American and South Korean flags were insignificant if not almost nonexistent. Their distortions of the reception Trump received showed the desire of his critics on the home front, the USA, to discredit and undermine not only his presidency but also the U.S.-Korean alliance. Trump's travels through East Asia on one of the longest overseas missions by any American president should build up his image at home though doubtless his enemies will never give up their harsh criticism of everything he says and does. It would be hard to deny, however, that he seems to have solidified his relationship with President Moon even though they are not going to agree on the need to hold out the threat of a military option, including a preemptive strike against the North's nuclear and missile facilities. Trump pointedly avoided use of those inflammatory terms while standing beside Moon at a Blue House press briefing that I attended after their summit. Nor did he mention that possibility in an extremely hard-hitting speech before the National Assembly that I also attended. Trump did, however, brandish the threat of military retaliation in ways that would please his highest-level aides, notably Defense Secretary Jim Mattis, who had been to Korea only the week before, and his security adviser, H.R. McMaster, who was with him on his Asian odyssey. Just look at all those warships we have near the Korean peninsula, was his message while in Seoul. They were ready to strike at a moment's notice, he seemed to be saying. And South Korea also is building up its defenses, as both Trump and Moon agreed. In fact, Trump held out the possibility that Korea might soon be buying billions of dollars of American equipment ranging from advanced radar to the latest model warplanes. As Trump, standing beside Moon at the Blue House, noted triumphantly, Korean defense contracts might help to redress the growing trade imbalance between the U.S. and Korea and also provide jobs for American workers. Trade, though, ranked second among priorities. Trump mentioned it while in Seoul, and he emphasized it still more in Tokyo and Beijing, but his words on the topic made little impact. Moon did not touch upon it at their briefing, and China's Xi Jinping came through with only vague reassurances. U.S. business leaders, accompanying Trump, made a show of signing billions of dollars in contacts that they would have signed anyway. The U.S. may negotiate minor changes in KORUS, the Korea-US Free Trade agreement, and China and Japan may make superficial concessions, but the betting is the U.S. trade deficit will continue to grow. No doubt, however, Trump appealed to Korean patriotic sentiments with his praise of Korea's achievements and his lengthy, detailed condemnation of North Korea in his National Assembly speech. His call for "peace through strength" and his passionate assertion of the primacy of the Korean-American alliance was reassuring both to Koreans and to. Americans who might wonder about the depth of his commitment. Trump's visit to Vietnam, however, may have had the opposite effect in the U.S. and perhaps in Korea too. There he was, more than 40 years after the defeat of the U.S.-backed South Vietnamese army and the end of the old Saigon regime, praising the victors to the skies, harking back to their 2,000-year struggle, congratulating them for their spirit and courage, all qualities that were needed to annihilate the American and South Vietnamese forces. For those who spent years in Vietnam, the parallels between the Vietnam debacle and the North-South confrontation on the Korean peninsula are alarming even as the US. forms close ties with Vietnam as a counter to China's power in the region, including its claim to the entire South China Sea. The Korean case, thankfully, is the mirror opposite of Vietnam. There are no North Korean forces south of the demilitarized zone, and there is no talk, except among pro-North idiots, about a peace treaty that would surely be a sellout. We can only hope that Trump sticks by the pledges he made in Seoul while remembering the defeat of the Americans and their South Vietnamese allies as a lesson not to be repeated in Korea.